Most images can be mounted using any of the following methods. The image is printed onto professional grade photographic canvas, then sprayed with protective coatings and stretched onto 1.5" thick mounting bars. The result is a painterly look to a photographic image. This method works well with soft and subtle images. 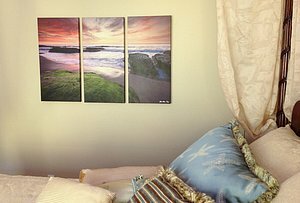 Some images work well as a triptych, where the image is divided into three pieces. The portion of the image which would show in the gap is wrapped to either side of the pieces so that when you look at the art from an angle you see a continuous image. This creates an art piece with more depth and one that can work on curved walls. High Resolution Ink Jet prints using archival ink and professional photographic paper. Then have the print mounted by your local framing dealer. For an additional charge, prints can be spray coated for additional protection. Prints can be traditionally mounted in an archival fashion into wooden frames. Print and Mat are protected by glass on smaller sizes and safety acrylic on larger pieces. Upgraded frames and acrylic are available for additional charge. This contemporary float mount option is great for some interiors. The photographic print is laminated for protection and then bonded to roughly a 1/4" thick piece of plastic, called Sintra. Then a frame is attached to the back for rigidity and hanging. The result is an image that floats roughly 1/2" off the wall and without any glare from glass. A powerful look for very modern or contemporary interiors. The photographic print is mounted to the back of a 1/2" thick piece of Acrylic. The edges of the Acrylic are polished and the piece is mounted to float off the wall by four aluminum standoffs. While this method does produce glare, it delivers a very modern and high quality impression.